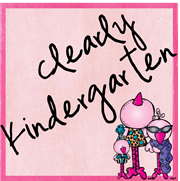 Clearly Kindergarten: Common Core Math Freebie! I know it has been awhile since I blogged anything, I feel like I have been running a race to keep up lately!! But a rainy Saturday here is a great excuse to get caught up on some blogging! So I will admit I am feeling a little (OK a lot) overwhelmed with the Common Core transition but I am lucky to have a great team that works together to make things easier! Our district is starting with math, so we are working on developing math activities and curriculum that is aligned to the Common Core. I am loving all of the new activities we are finding and trying out....but not having a text book makes me a little nervous. Not that I have ever found a text book that I thought was perfect. What we really need now are good assessments to go along with our activities so I can make sure all my kiddos are "getting it". I love good data! We are focusing on numbers 0-10 right now so I thought I would share one of the activities I made for my math centers this week. The students will get 10 two color counters (the ones that are red on one side and yellow on the other). They will place all 10 in a cup and then shake and spill them onto their table. 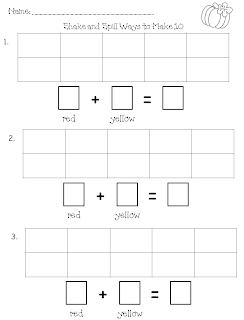 They will then fill in the 10 frame with the number of counters that were red and yellow. They will record their numbers in the boxes underneath. If you would like a copy of the sheet I am going to use click on the picture below to grab it for free! Hope you like it! If you have any great assessments that you use or if you like the freebie I'd love for you to comment! Love this freebie. It'll be a great addition to my small group activities. I've also boo'd you. Stop by my blog to see the rules! !